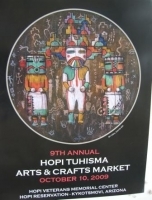 We offer "Event" posters, not only of the more popular shows like Santa Fe Indian Market and Gallup Inter-Tribal Ceremonial, but also posters from Lawrence Indian Art Show, Chickasaw Annual Meeting & Festival, and American Indian Film Festival. We regularly add obscure Indian Event Posters. 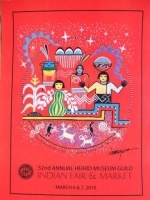 Heard Indian Fair & Market, 52nd Annual. "Ancestral Mentors". Amado Peña Kermezaar Art and Crafts. September, 2010.